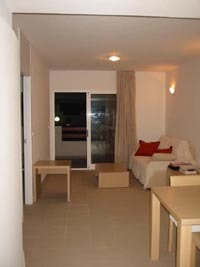 Apartment in Playa Flamenca for holiday rental. 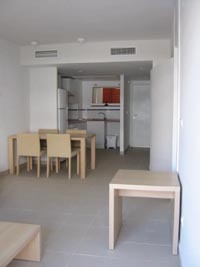 This apartment in the El Rincon complex in Playa Flamenca has two bedrooms and an open plan kitchen, dining, living area. The kitchen is fully equipped with cooker, fridge/freezer, washing machine, microwave, coffee maker, kettle, toaster and so on. The dining area has table and chairs ( ! ), the living area has a sofa and television. The TV has Spanish satellite so you can get Sky channels, British channels and radio. Unfortunately, due to legal issues, there is currently some uncertainty about which channels are available. 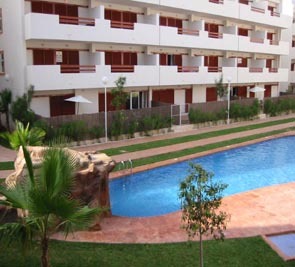 Patio doors lead to the balcony, which has garden furniture and overlooks one of the 2 communal swimming pools on the complex. The main bedroom can be a double or two singles, and its ensuite has a bath with shower, WC, wash hand basin and bidet. There are also patio doors to the balcony. 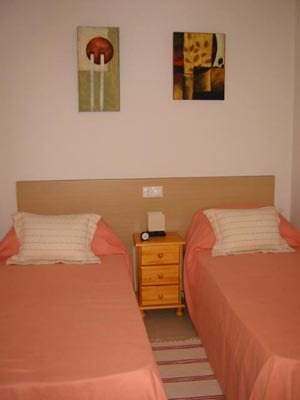 The twin bedroom has 2 single beds and its ensuite has a walk-in shower, WC and wash hand basin. The gadget on the wall of the living room controls air conditioning and heating. This works best with doors and windows closed. Full instructions can be found in the black folder in the flat. We also now have a stand-alone halogen heater, which can be positioned as required. 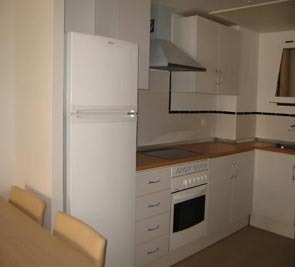 Information about the cooker and grill, washing machine and microwave/grill can also be found in the apartment. There is a cafetiere and an electric coffee maker. A list of the available channels and hints on finding them are also in the apartment. They include BBC1 and 2, ITV1 and 2, Sky 1, 2, 3, news and sports and Setanta - subject to the current situation. There is an iron in the kitchen and a hairdryer is also supplied. There are 2 beach mats and 2 beach chairs in the utility room. Also stored here are the ironing board, drying rack, cool bag, shopping trolley and brush and mop. Please no smoking or pets in the apartment. 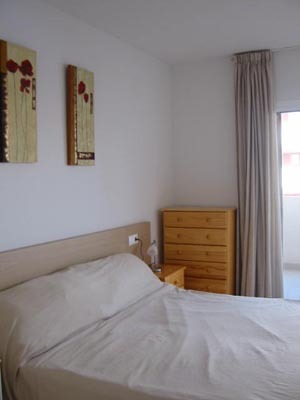 You should find the apartment clean and ready for you, with the electricity, fridge and water heating on, clean towels and beds made up.